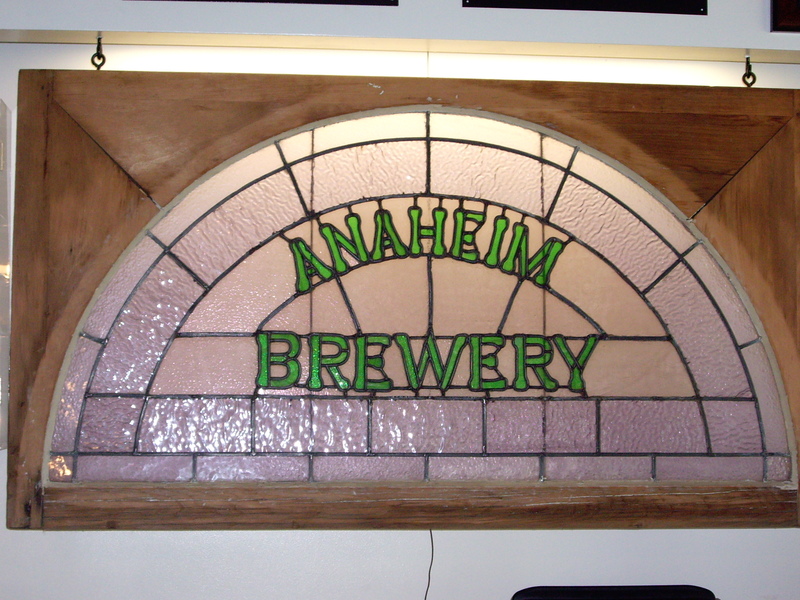 This transom window is from the original Anaheim Brewery. We heard about its existence from a neighbor. The owners live in Orange County and got the window from a relative who collected breweriana. After we met and I told them about re-establishing the Anaheim Brewery, they very graciously allowed me to photograph and take measurements of the window. A heartfelt thanks to them for preserving a piece of Anaheim history. The pale lavender glass around the edges was originally clear glass. Around 1880, glass manufacturers began using manganese in their formulas to de-colorize otherwise green-tinted glass. The practice generally stopped in 1914, when World War I cut off the U.S.’s main source of manganese – Germany. Although manganese was used to keep glass clear, the mineral absorbs the sun’s ultraviolet rays, causing a photo-sensitive chemical reaction, that then imparts a purple or pinkish tone to the glass. This entry was posted in History and tagged anaheim brewery, breweriana. Bookmark the permalink.